Quinten Johnson, a three-star safety form St. John's College in Washington D.C., announced Tuesday he plans to play for the Wolverines. The Michigan football team continues to pile up commitments. Quinten Johnson, a three-star safety form St. John's College in Washington D.C., announced Tuesday at The Opening Finals at The Star in Frisco, Texas, that he plans to play for the Wolverines as part of the 2019 class. According to 247Sports, Johnson also considered Arizona, Boston College, Alabama, Penn State and Maryland. Johnson is the Wolverines' fourth commitment in three days — and third in the 2019 class, following the pledge of Blairtown, N.J., defensive end David Ojabo on Monday and all-purpose back Eric Gray of Memphis, Tenn., on Tuesday. Michigan also received a commitment Monday night from four-star West Aurora (Ill.) defensive end Denver Warren, who's part of the 2020 recruiting class. The 5-foot-11, 190-pound Johnson is rated the No. 4 player in Washington, D.C., and the No. 37 safety nationally, according to the 247Sports Composite. He is the third defensive back to commit to Michigan's 2019 class, joining three-star cornerback DJ Turner II (North Gwinnett in Suwanee, Ga.) and three-star safety Joey Velazquez (St. Francis De Sales of Columbus, Ohio). 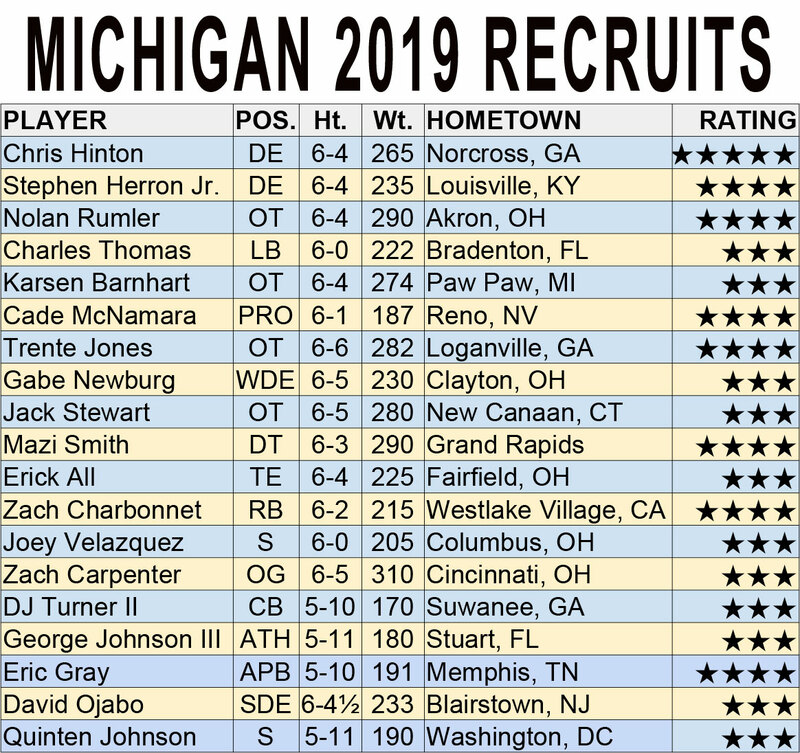 Michigan has 19 commitments in its 2019 class, which as of Tuesday afternoon ranks No. 3 nationally, and No. 1 in the Big Ten, according to the 247Sports Composite.